It’s hard not to notice that NVIDIA has a bit of a problem right now. In the months since the launch of their first Kepler product, the GeForce GTX 680, the company has introduced several other Kepler products into the desktop 600 series. With the exception of the GeForce GT 640 – their only budget part – all of those 600 series parts have been targeted at the high end, where they became popular, well received products that significantly tilted the market in NVIDIA’s favor. The problem with this is almost paradoxical: these products are too popular. Between the GK104-heavy desktop GeForce lineup, the GK104 based Tesla K10, and the GK107-heavy mobile GeForce lineup, NVIDIA is selling every 28nm chip they can make. For a business prone to boom and bust cycles this is not a bad problem to have, but it means NVIDIA has been unable to expand their market presence as quickly as customers would like. For the desktop in particular this means NVIDIA has a very large, very noticeable hole in their product lineup between $100 and $400, which composes the mainstream and performance market segments. These market segments aren’t quite the high margin markets NVIDIA is currently servicing, but they are important to fill because they’re where product volumes increase and where most of their regular customers reside. Long-term NVIDIA needs more production capacity and a wider selection of GPUs to fill this hole, but in the meantime they can at least begin to fill it with what they have to work with. This brings us to today’s product launch: the GeForce GTX 660 Ti. With nothing between GK104 and GK107 at the moment, NVIDIA is pushing out one more desktop product based on GK104 in order to bring Kepler to the performance market. Serving as an outlet for further binned GK104 GPUs, the GTX 660 Ti will be launching today as NVIDIA’s $300 performance part. In the Fermi generation, NVIDIA filled the performance market with GF104 and GF114, the backbone of the very successful GTX 460 and GTX 560 series of video cards. Given Fermi’s 4 chip product stack – specifically the existence of the GF100/GF110 powerhouse – this is a move that made perfect sense. However it’s not a move that works quite as well for NVIDIA’s (so far) 2 chip product stack. In a move very reminiscent of the GeForce GTX 200 series, with GK104 already serving the GTX 690, GTX 680, and GTX 670, it is also being called upon to fill out the GTX 660 Ti. All things considered the GTX 660 Ti is extremely similar to the GTX 670. The base clock is the same, the boost clock is the same, the memory clock is the same, and even the number of shaders is the same. In fact there’s only a single significant difference between the GTX 670 and GTX 660 Ti: the GTX 660 Ti surrenders one of GK104’s four ROP/L2/Memory clusters, reducing it from a 32 ROP, 512KB L2, 4 memory channel part to a 24 ROP, 384KB L2, 3 memory channel part. With NVIDIA already binning chips for assignment to GTX 680 and GTX 670, this allows NVIDIA to further bin those GTX 670 parts without much additional effort. Though given the relatively small size of a ROP/L2/Memory cluster, it’s a bit surprising they have all that many chips that don’t meet GTX 670 standards. In any case, as a result of these design choices the GTX 660 Ti is a fairly straightforward part. 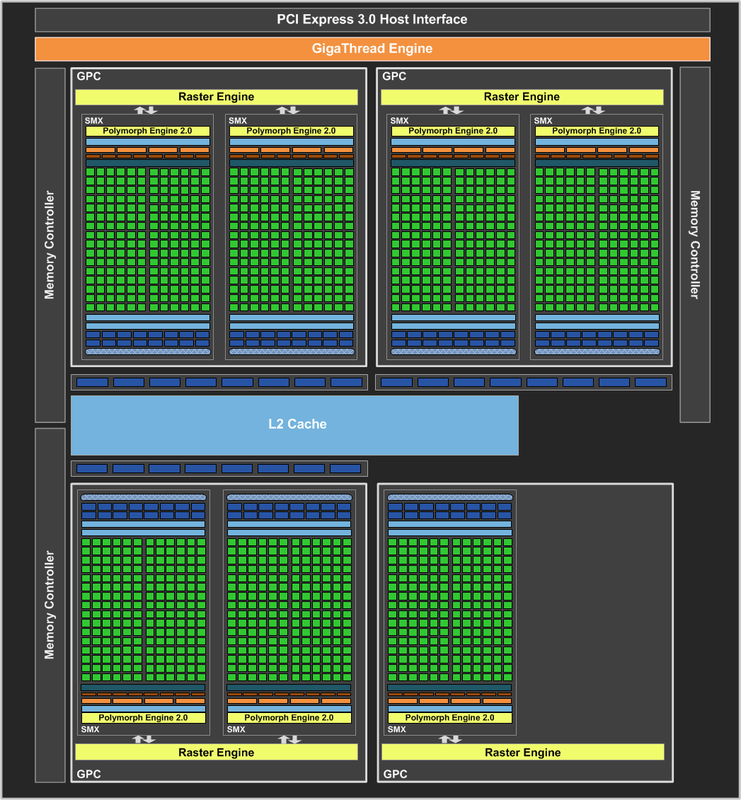 The 915MHz base clock and 980MHz boost clock of the chip along with the 7 SMXes means that GTX 660 Ti has the same theoretical compute, geometry, and texturing performance as GTX 670. The real difference between the two is on the render operation and memory bandwidth side of things, where the loss of the ROP/L2/Memory cluster means that GTX 660 Ti surrenders a full 25% of its render performance and its memory bandwidth. Interestingly NVIDIA has kept their memory clocks at 6GHz – in previous generations they would lower them to enable the use of cheaper memory – which is significant for performance since it keeps the memory bandwidth loss at just 25%. How this loss of render operation performance and memory bandwidth will play out is going to depend heavily on the task at hand. We’ve already seen GK104 struggle with a lack of memory bandwidth in games like Crysis, so coming from GTX 670 this is only going to exacerbate that problem; a full 25% drop in performance is not out of the question here. However in games that are shader heavy (but not necessarily memory bandwidth heavy) like Portal 2, this means that GTX 660 Ti can hang very close to its more powerful sibling. There’s also the question of how NVIDIA’s nebulous asymmetrical memory bank design will impact performance, since 2GB of RAM doesn’t fit cleanly into 3 memory banks. All of these are issues where we’ll have to turn to benchmarking to better understand. The impact on power consumption on the other hand is relatively straightforward. With clocks identical to the GTX 670, power consumption has only been reduced marginally due to the disabling of the ROP cluster. NVIDIA’s official TDP is 150W, with a power target of 134W. This compares to a TDP of 170W and a power target of 141W for the GTW 670. Given the mechanisms at work for NVIDIA’s GPU boost technology, it’s the power target that is a far better reflection of what to expect relative to the GTX 670. On paper this means that GK104 could probably be stuffed into a sub-150W card with some further functional units being disabled, but in practice desktop GK104 GPUs are probably a bit too power hungry for that. Moving on, this launch will be what NVIDIA calls a “virtual” launch, which is to say that there aren’t any reference cards being shipped to partners to sell or to press to sample. Instead all of NVIDIA’s partners will be launching with semi-custom and fully-custom cards right away. This means we’re going to see a wide variety of cards right off the bat, however it also means that there will be less consistency between partners since no two cards are going to be quite alike. For that reason we’ll be looking at a slightly wider selection of partner designs today, with cards from EVGA, Zotac, and Gigabyte occupying our charts. As for the launch supply, with NVIDIA having licked their GK104 supply problems a couple of months ago the supply of GTX 660 Ti cards looks like it should be plentiful. Some cards are going to be more popular than others and for that reason we expect we’ll see some cards sell out, but at the end of the day there shouldn’t be any problem grabbing a GTX 660 Ti on today’s launch day. Pricing for GTX 660 Ti cards will start at $299, continuing NVIDIA’s tidy hierarchy of a GeForce 600 at every $100 price point. With the launch of the GTX 660 Ti NVIDIA will finally be able to start clearing out the GTX 570, a not-unwelcome thing as the GTX 660 Ti brings with it the Kepler family features (NVENC, TXAA, GPU boost, and D3D 11.1) along with nearly twice as much RAM and much lower power consumption. However this also means that despite the name, the GTX 660 Ti is a de facto replacement for the GTX 570 rather than the GTX 560 Ti. 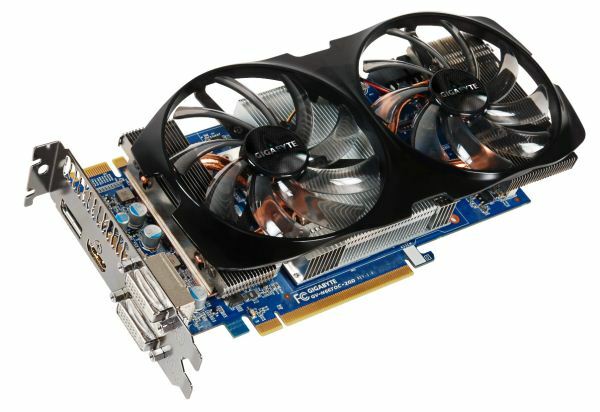 The sub-$250 market the GTX 560 Ti launched will continue to be served by Fermi parts for the time being. NVIDIA will no doubt see quite a bit of success even at $300, but it probably won’t be quite the hot item that the GTX 560 Ti was. Meanwhile for a limited period of time NVIDIA will be sweeting the deal by throwing in a copy of Borderlands 2 with all GTX 600 series cards as a GTX 660 Ti launch promotion. Borderlands 2 is the sequel to Gearbox’s 2009 FPS/RPG hybrid, and is a TWIMTBP game that will have PhysX support along with planned support for TXAA. Like their prior promotions this is being done through retailers in North America, so you will need to check and ensure your retailer is throwing in Borderlands 2 vouchers with any GTX 600 card you purchase. On the marketing front, as a performance part NVIDIA is looking to not only sell the GTX 660 Ti as an upgrade to 400/500 series owners, but to also entice existing GTX 200 series owners to upgrade. The GTX 660 Ti will be quite a bit faster than any GTX 200 series part (and cooler/quieter than all of them), with the question being of whether it’s going to be enough to spur those owners to upgrade. NVIDIA did see a lot of success last year with the GTX 560 driving the retirement of the 8800GT/9800GT, so we’ll see how that goes. Anyhow, as with the launch of the GTX 670 cards virtually every partner is also launching one or more factory overclocked model, so the entire lineup of launch cards will be between $299 and $339 or so. This price range will put NVIDIA and its partners smack-dab between AMD’s existing 7000 series cards, which have already been shuffling in price some due to the GTX 670 and the impending launch of the GTX 660 Ti. Reference-clocked cards will sit right between the $279 Radeon HD 7870 and $329 Radeon HD 7950, which means that factory overclocked cards will be going head-to-head with the 7950. On that note, with the launch of the GTX 660 Ti we can finally shed some further light on this week’s unexpected announcement of a new Radeon HD 7950 revision from AMD. As you’ll see in our benchmarks the existing 7950 maintains an uncomfortably slight lead over the GTX 660 Ti, which has spurred on AMD to bump up the 7950’s clockspeeds at the cost of power consumption in order to avoid having it end up as a sub-$300 product. The new 7950B is still scheduled to show up at the end of this week, with AMD’s already-battered product launch credibility hanging in the balance. For this review we’re going to include both the 7950 and 7950B in our results. We’re not at all happy with how AMD is handling this – it’s the kind of slimy thing that has already gotten NVIDIA in trouble in the past – and while we don’t want to reward such actions it would be remiss of us not to include it since it is a new reference part. And if AMD’s credibility is worth anything it will be on the shelves tomorrow anyhow. A lot of em are going for $299, but why put anything in there but RELEASE PRICE on the chart - that way you can show the GTX570 at $349. They're not loosing focus, it's a new strategy and it must work wonders. Instead of releasing new products as quickly as possible and fill the market with all the parts from low to high-end performance, they get out the new higher-end parts and rely on their last gen cards to fill the holes.